Do you have to be 18 or older to enter? Yes, all Neko Nation events are 18+ events. All our events take place in licensed premises and you will be required to have photo ID for entry. What sort of ID do you accept? ID must be current and not expired. There are no exceptions to these three forms of ID, student ID’s, birth certificate and mecha licenses do not count, as per Australia liquor licensing laws. Are there any Neko Nation all ages events? No, all our events are 18+ only. This refers to a booking fee charged by the ticket seller. What do I wear to Neko Nation events? Do I have to cosplay? Do I have to wear cat ears? 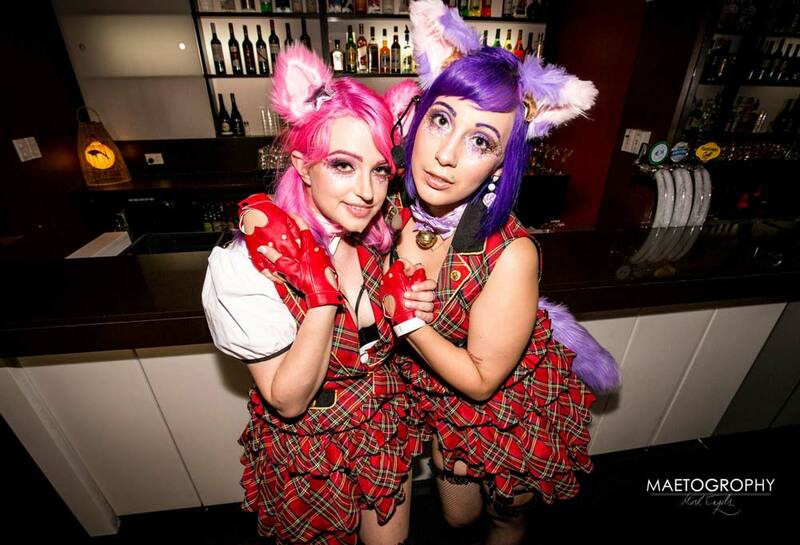 Neko Nation encourages all our guests to cosplay (we’re the only club in Australia where it’s encouraged!) and to dress up if possible to help create a unique atmosphere at our events. It is not mandatory but we do encourage it with prizes up for grabs. Our dress policy is highly open minded and is similar to that of an anime convention. Please keep in mind that this is not a cosplay competition at a convention and as such fragile cosplays, those that are difficult to move around in or ones that can be quite warm are not recommended and should only be worn at your own risk!. Are we able to bring weapons as part of a cosplay? Hoslter: The prop can easily be holstered and put away and is only to come out for photos opportunity away from the dance floor. It is however better to leave weapons at home since the lower lighting and people dancing around does make weapons even more hazardous than they would at a con. If you feel it is essential then make sure it is made of weaker materials (no metal or wood, plastic and cardboard would be acceptable), it doesn’t look threatening (guns and swords are unlikely, wands and death notes are acceptable) and can be holstered or secured while moving. What genres of music do your DJs play? Each show depends on what DJs are available, but we generally stick to Japanese music, K-pop, anime, gaming and EDM. Keep in mind have a lot of other genres played at our events! If you’d like to know what genres will be played at a show you’re attending it will be on the event page. We do generally aim to cater to a large variety to keep everyone happy and to reward those who are open minded with their music tastes. You will be able to find appropriate links on the event page to buy tickets online. How often do you run Neko Nation events? We are running our final event in Sydney on May 18th 2019. More details here, don’t miss out! How quickly do you respond to messages or e-mails? Generally e-mail responses are replied to within 24-48 hours. Please do not expect replies on show weekend due to working at the event, please try asking on Facebook events or groups to get a last minute answer.